This tutorial provides you with a foundation for working with shapes in Adobe Photoshop Elements. 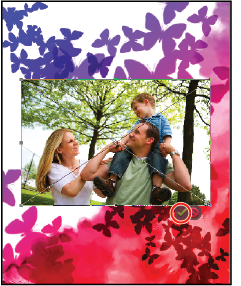 It is the twelfth lesson in the Adobe Photoshop Elements 10 Digital Classroom book. Shapes are vector-based objects that can be used like brushes to add emphasis and excitement to your work. The details of vector-based artwork aren’t really important here, but the advantage of vector-based shapes is that, unlike photographs, they can be scaled to any size without a loss of quality. Photoshop Elements ships with many pre-created shapes that can cover a wide range of different needs. Everything from animal silhouettes to comic-style thought balloons are represented here. In this exercise, you will use a shape to create a picture frame for an imported graphic. 1 In the Layers panel, click the top layer, Gradient, to activate it. Choose File > Place to import a photo into this document. Navigate to the Lessons folder and double-click the Family in the Park.jpg file to open it. 2 Click the checkmark at the bottom of the image to approve the placement of the file. All placed items must be approved before you can work with them in Photoshop Elements. 3 Click and hold the Rectangle tool ( ) in the Toolbox, and select the Custom Shape tool ( ) from the menu that pops up. There are several shape options, from simple circles and rectangles to more complex custom shapes. 4 In the Options bar at the top of the workspace, choose frame 19 from the Shape drop-down menu and double-click it. Click and drag from the upper-left corner of the photo to the lower-right corner. Additional shapes can be loaded by shape icon in the Options bar and choosing them from a list. If the frame doesn’t fit exactly, press Ctrl+T (Windows) or Command+T (Mac OS) on your keyboard and select the Move tool, position the cursor over one of the squares of the bounding box on any side, then click and drag to enlarge or contract it. You have to click the check mark to approve your transformation. 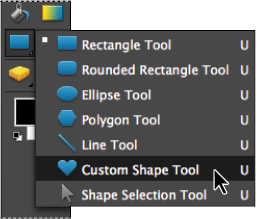 5 Double-click on the new Shape layer’s name in the Layers panel and rename it Frame. Drag the Frame layer and drop it just below the layer named Family in the Park. Hold down the Shift key and click the Family in the Park layer to select it as well. Press the Link Layers button ( ) at the bottom of the Layers panel to link the two layers together. 6 With the Move tool ( ) active, press Ctrl+T (Windows) or Command+T (Mac OS) on your keyboard or choose Image > Transform > Free Transform and position the cursor outside one of the corner points of the bounding box that surrounds the layer, and wait for it to become a curved arrowhead. Click and drag to rotate the layer. Click the checkmark to approve the change. The keyboard command for Save is Ctrl+S (Windows) or Command+S (Mac OS), while the keyboard command for Save As is Ctrl+Shift+S (Windows) or Command+Shift+S (Mac OS). Although you haven’t used them in this lesson, there are other drawing tools in the program that can be used either individually or in combination with other tools to produce some very creative results. Pencil tool: The Pencil tool creates hard-edged, freehand lines. In addition to the most obvious use—sketching in Photoshop Elements—the Pencil tool functions much like a brush with a consistently hard edge. Dodge, Burn, and Sponge tools: Taken from two traditional tools used in photography, the Dodge tool is used to lighten areas of an image, while the Burn tool darkens them. These tools are used to bring out details in the shadow and highlight areas of an image. A third tool associated with them, the Sponge tool, is used to saturate or de-saturate the color areas of an image. Blur, Sharpen, and Smudge tools: The Blur and Sharpen tools are used to soften hard edges in an image and increase the contrast between pixels, respectively. The Smudge tool simulates the effect of rubbing against wet paint, picking up the color where the drag begins and moving through the image as the drag continues. The Eraser tool: The Eraser tool is used to change pixels in an image. When used on the background layer, the tool erases to the current background color, and when used on any other layer, it erases to transparency. The Cookie Cutter tool: The Cookie Cutter tool uses a series of custom shapes to mask out an image. Anything inside of the shape remains, while what is outside is removed. You can think of it as a kind of custom crop tool. 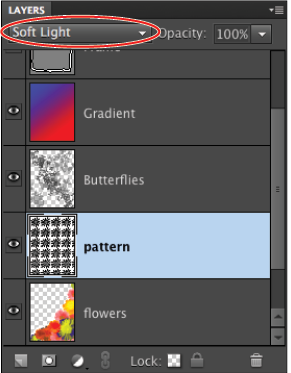 In addition to brushes and shapes, another useful and fun feature that Photoshop Elements has is patterns. Patterns are repeatable images or parts of images that can be applied similar like how color is applied. In this exercise, you will define and apply a pattern to the Happy Birthday image. Patterns can be created from the contents of any square or rectangular selection. Any type of artwork—including photographs, drawings, and scanned art—can be used to create a pattern. If you can draw a rectangular selection around it, you can define it as a pattern. 1 In the Editor, choose File > Open and navigate to the Lessons folder that you copied from the DVD that came with this book. Open the file named flowerpattern.psd. 2 Select the Rectangular Marquee tool ( ) from the Toolbox on the left. Click and drag with the tool to select the entire canvas. You can use the keyboard command Ctrl+A (Windows) or Command+A (Mac OS) to select all the contents of a document. 3 Choose Edit > Define Pattern from Selection to create the pattern. Patterns saved with the program are always accessible in any file. 4 In the Pattern Name dialog box, type flower pattern and press OK. Choosing File > Open Recently Edited File is a quick way to locate and open a file that you have recently been working on. 2 In the Layers panel click the flowers layer to select it, and then click on the Create a New Layer button (). Double-click on the name of the new layer, and rename it pattern. 3 Choose Edit > Fill Layer. Choose Pattern from the Use drop-down menu of the Contents section. From the Custom Pattern menu, choose the pattern you created in the previous step; it is the last one in the menu. Leave all other options as you find them, and press OK. 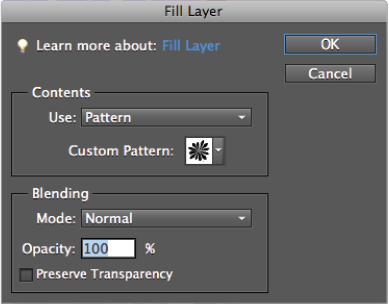 The Fill Layer dialog box can fill a layer with a color or pattern. 4 In the Layers panel, change the blending mode for this layer from Normal to Soft Light. The addition of the pattern creates an even more textured background. 5 Choose File > Save to save your work. Close the file. Creating scrapbooks and photo albums to record memorable events has been a tradition in many families for a long time. However, over the last decade or so, scrapbooking has become more widespread than ever before. This exercise will take you through the process of creating a scrapbook page using Photoshop Elements. You will use the various tools and effects in the program to create the impression of both texture and dimensionality in your work.